Need help to view the videos? Need help to open tools? 1. "Support Wiki" links in some mathies tools point to pages that are no longer available. Visit the Support Pages instead. 2. Having trouble accessing sample files? See the File Operations support page. 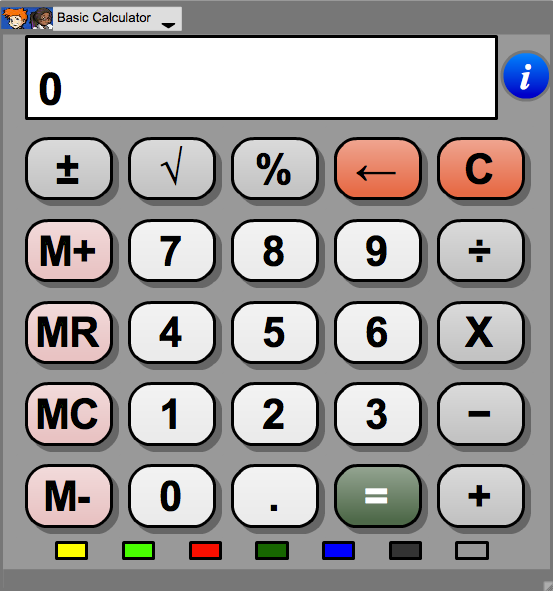 A four-function calculator with square roots and percentage. Explore transformations of functions by creating an equation using parameters then changing their values to see how the equation is affected. Up to three functions can be graphed. 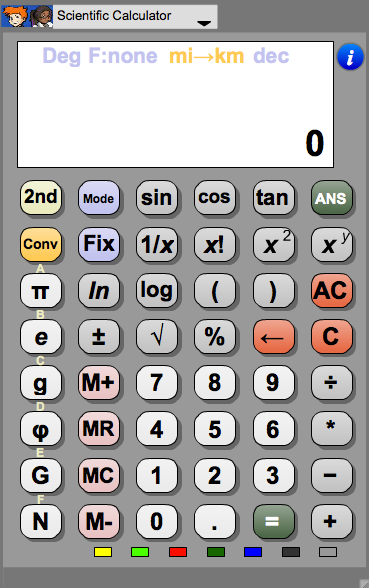 A scientific calculator with unit conversion. Represent numbers, ratios and percents. Explore patterns and measurement. Create geometric designs. Tiles can be squares, circles or rounded squares. Users can change colours, create mirror images, rotate, and copy selections. 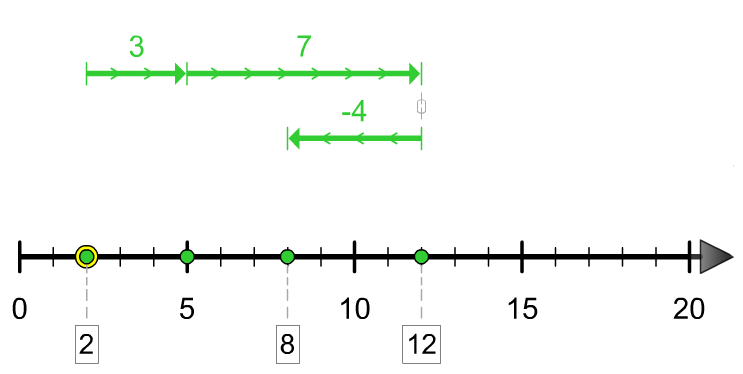 Compare integers using words, symbols and points on a number line. Compare whole numbers up to 1 000 000 using words, symbols and points on a number line. 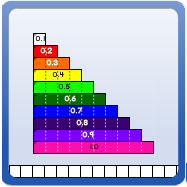 Decimal Number Rods are included in the Relational Rods+ bundle. Explore the Pattern Rule, Algebraic, Pictorial, Story and Graphical Representations of a linear growing pattern. Make a change to one representation and see how this change affects the other representations. 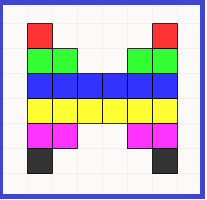 Represent fractions by dragging pieces from the fraction tower into the workspace. Pieces can be placed in a line to form a train. 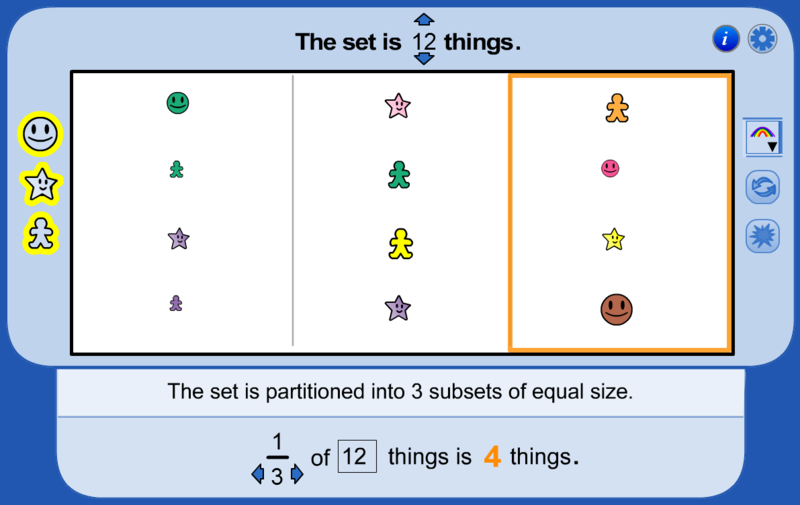 Manipulate the pieces and trains to compare and order fractions or to model fraction operations. Exploring, Creating and Naming Fraction Representations (2:56) for earlier version. 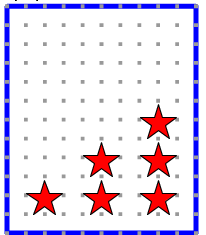 Moving, Copying, Deleting and Aligning Fraction Representations (2:59) for earlier version. Explore a variety of mathematics topics using this sketch created with The Geometer’s Sketchpad™ (GSP). This sketch consists of a collection of virtual manipulatives including: algebra tiles, base 10 blocks, fraction circles, gears and pulleys, geoboards, integer chips, spinners, tangrams, and many more. 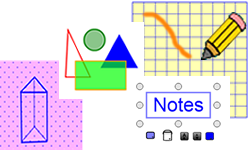 The Geometer's Sketchpad™ (GSP) can be used to create dynamic shapes to explore mathematics. Many activities with premade sketches are also available for students to explore number relationships, geometry, measurement and patterning. GSP is Ministry-licensed software available for download to a personal computer. An authorization code is available from your teacher or use a trial version. Get Sketchpad. 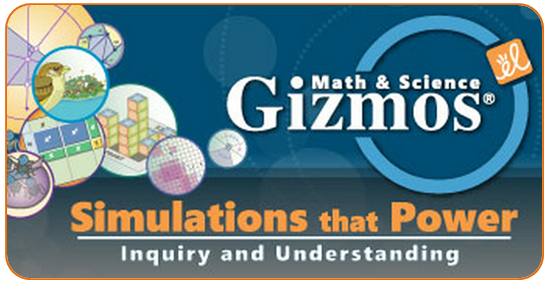 ExploreLearning.com offers hundreds of interactive online simulations (called GIZMOS) for math. GIZMOS are fun, easy to use, and can help you develop a deep understanding of mathematical concepts through exploration. Using GIZMOS you can take measurements, record data, calculate, experiment and graph information quickly making math concepts easier to understand. Licensed through your school; password access required for students Gr. 7-12; free 30-day trial available. Each ExploreLearning class has a unique Class Code for you to create an account. If you do not know your Class Code, please consult your teacher. Introductory tool to plot graphs such as those that arise from linear growing patterns. The grid is limited to the first quadrant. The scale, labels and title can be easily changed. 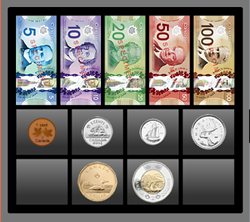 Represent various amounts using realistic images of Canadian coins and bills. Customize the money tray, drag money singly or in multiples of 2, 5, and 10, and annotate work. Exploring the Basic Functionality (2:45) for earlier version. Write solutions, sketch diagrams, import pictures, create graphs and record your mathematical thinking. Use one of four backgrounds: grid, isometric dot, lined or blank. Use built-in line, shape and text annotation objects, including number lines, rulers, grids and polygons. Copy and rotate any annotation object. File Operations (Save, Open, Open from WWW and iTunes File Sharing) are supported. Exploring the Basic Functionality (2:37) for earlier version. 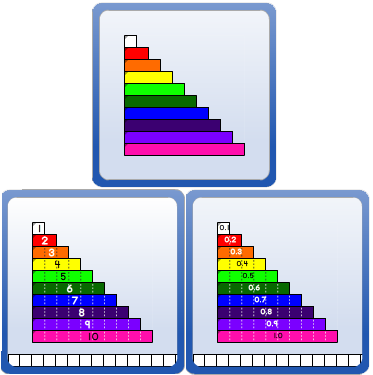 The Number Chart tool includes two number charts (0-99 or 1-100), an addition chart (to 12 + 12), and a multiplication chart (to 12 x 12). 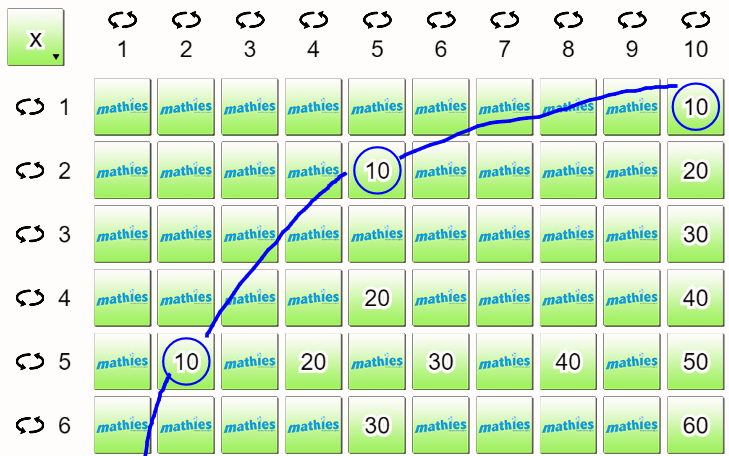 These charts are an ideal tool to support students as they develop fundamental math skills. Number charts offer versatile ways to explore relationships among numbers and develop math skills such as counting, patterning, problem solving, and using a variety of strategies to perform arithmetic calculations (including using related math facts). Note: This tool has been developed using HTML5 allowing it to be used in a browser on any desktop or mobile device. Represent, compare, order and operate on whole numbers and integers using vectors, hops, magnitude bars, number ribbons or points on the number line. 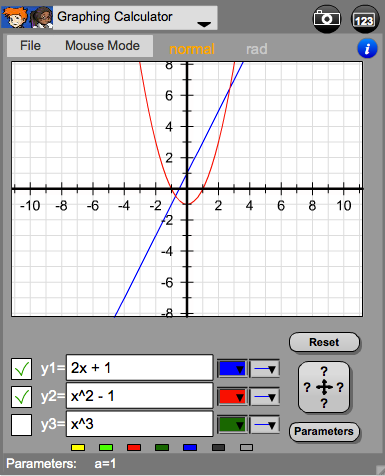 This dynamic tool makes it easy to zoom in, pan and switch betweeen horizontal and vertical number lines. Is 1/6 of 12 a whole number? Can 10 objects be partitioned into 4 subsets of equal size? A virtual manipulative similar to the physical ones commonly available in classrooms. Eighteen different types of blocks can be dragged into the workspace from the scrollable selection panel at the left. Once in the workspace, blocks or groups of blocks can be moved, copied, reflected, or rotated. 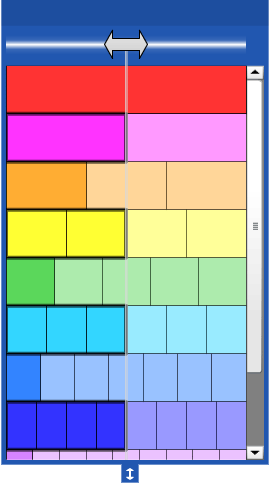 The colour of each type of block can be changed. Blocks can be used to create designs and develop mathematical understanding (e.g., patterning, geometry, whole numbers, fractions and decimals). Design your own pictorial representation of a linear growing pattern using a variety of shapes and colours. Represent, compare and operate on fractions using a volume model. 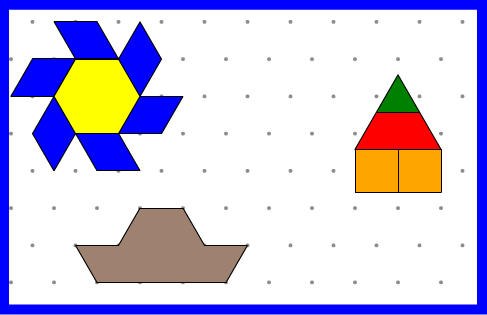 Fill containers to represent fractions. 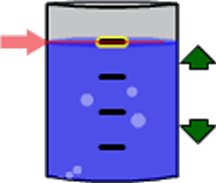 Pour the contents to model various operations. Use the Rekenrek to build understanding of whole numbers, number relationships, and strategic reasoning for counting, addition, subtraction and multiplication. Relate numbers to the anchors of 5 and 10. Use the annotation feature and imported images to communicate solutions. Represent, compare, order, and operate on whole numbers, fractions or decimals by dragging rods from the tower into the workspace and manipulating them. The colour scheme of the rods can be customized, including to a traditional and a primary palette which are similar to physical manipulatives. Use the annotation feature and imported images to communicate solutions. File Operations (Save, Open, Open from WWW and iTunes File Sharing) are supported. Decimal Number Rods - rectangles of lengths 0.1 to 1.0 with numeric labels and dashed divisions on each rod. Sets of objects can be generated randomly or designed by the user. 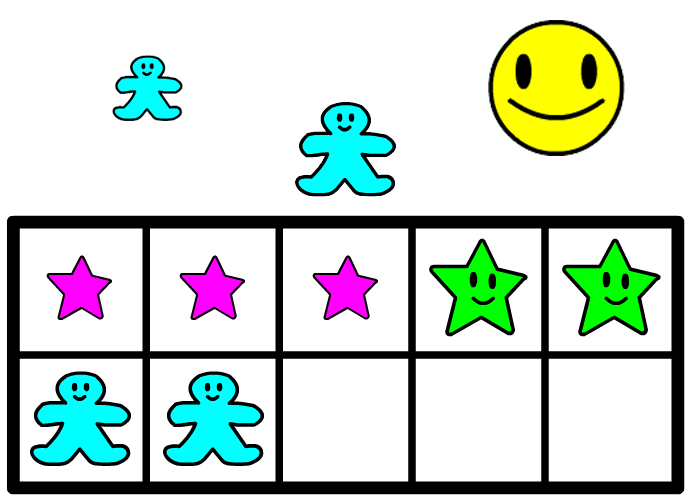 Organize objects using number frames (ten frames, five frames, frames of tenths). Represent, compose and decompose whole numbers, tenths, and fractions. Randomly scramble objects to new positions. Randomly create new sets of a particular size with specified attributes. Whole Number Rods are included in the Relational Rods+ bundle.